Manchester, Manchester University Press, Human Remains and Violence , , 236 p.
Human remains and identification presents a pioneering investigation into the practices and methodologies used in the search for and exhumation of dead bodies resulting from mass violence. Previously absent from forensic debate, social scientists and historians here confront historical and contemporary exhumations with the application of social context to create an innovative and interdisciplinary dialogue, enlightening the political, social and legal aspects of mass crime and its aftermaths. Through a ground-breaking selection of international case studies, Human remains and identification argues that the emergence of new technologies to facilitate the identification of dead bodies has led to a “forensic turn”, normalising exhumations as a method of dealing with human remains en masse. However, are these exhumations always made for legitimate reasons? Multidisciplinary in scope, this book will appeal to readers interested in understanding this crucial phase of mass violence’s aftermath, including researchers in history, anthropology, sociology, forensic science, law, politics and modern warfare. 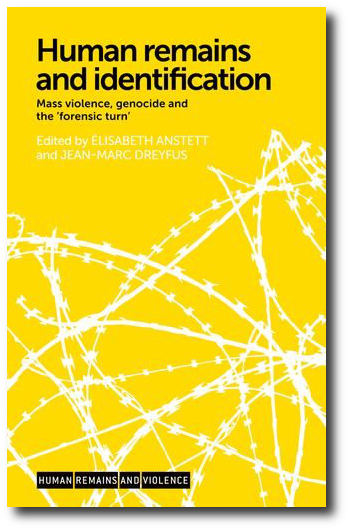 Jean-Marc Dreyfus is Reader in Holocaust Studies at the University of Manchester, UK, and a Director of the Corpses of Mass Violence and Genocide Programme funded by the European Research Council.